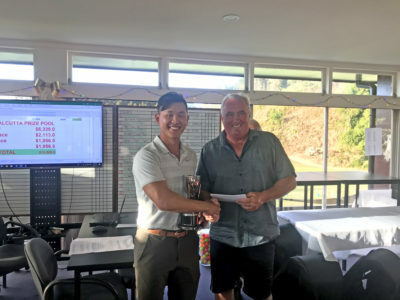 US golfer Luke Kwon has clinched first place in the 2019 Cardinal Logistics Pro-Am at Whitford Park Golf Club. More than 135 amateurs and 57 professionals took part in the annual event and the first pro-Am of the NZ calendar series. A strong field assembled at the weekend, with only a few of the top names missing, but including last year’s winner Pieter Zwart, Michael Hendry, Josh Geary, Mark Brown, and Gareth Paddison among the challengers. Course superintendent Colin Trim and his team had the course looking in top condition for the event. Day one saw the players greeted with excellent playing conditions, albeit rather warm in the afternoon. The first round leader was experienced campaigner Richard Lee, finding form to record a 5 under par 66. Luke Kwon and Mark Brown were tied for second, both shooting 4 under par 67. There were a number of players within striking distance a few shots back. The final day was also another stunner, with light winds and excellent playing conditions. The afternoon starters did have more wind to contend with early on, however it did abate somewhat later in the final round. With several holes remaining, it was becoming a tight battle between four players – Kwon, Brown, Richard Lee and Nick Coxon. Birdies were hard to find for some of the contenders and it was American Kwon who eventually took out top honours with a fine 3 under par 68 to go with his day one effort of 67. Brown held on to second place on his own with 67/70 and there was a 3-way tie for third between Coxon 69/69, Lee 66/72 and James Anstiss 68/70. The best rounds of the day went to Jared Pender and Harry Bateman with 67. The players were well-fed and watered in the hot conditions by a friendly team of volunteers. The event winner Kwon also won the NZ Q School event at Pukekohe the Tuesday prior to the Pro-Am. He had played Whitford Park GC a few times during the week which obviously paid off. Kwon is a good friend of Kiwi pro Nick Voke, who suggested Kwon come to Whitford Park to hone his game, which is what Voke had done prior to hitting the pro circuit and ultimately having some good early success. Kwon had previously played on some American circuits and was looking to find another avenue back on onto those tours. Whitford Park recently celebrated its 50th year of operation. The club was transformed from an Ostrich Farm in 1968, when the country club concept was initiated. Whitford Park operations/golf manager Ricky Scammell said this concept was unique in its time and still, today, provides a unique golfing experience, with the added bonus for members of having a swimming pool, tennis courts and 23-bay driving alongside the parkland course. “With tree-lined couch fairways and excellent greens, there was never a better time to become a member of this vibrant club,” said Scammell. “What better way to spend your day than with a relaxing game of golf, followed by a dip in the pool and a cold drink while reflecting on your round?